Recessed lighting, cove lighting, art lighting, sconces, etc. – We do it all! Lighting improvements significantly improve your level of comfort and increase your home’s resale value. Whether your home or office is newly built, a classic, or even a high-rise condo with concrete walls and ceilings, we will provide you with options to upgrade your lighting. 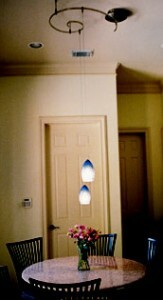 Do not settle for a single surface mount mushroom light fixture in the center of your rooms or table top lamps. Lighting is the first thing your guests see when they walk into your home and with our expertise, we will blend lights in each room so that each light has a specific purpose to really bring each room together in a welcoming way. Light-Tech Inc. will find out what your lighting needs are and take into consideration your current wiring, your budget, and provide you with the best solution for your home using contemporary light fixtures. 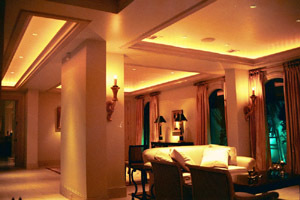 The Lighting upgrades that we provide are installing recessed lights or a chandelier, to brighten up a dark room with ambient lighting, cove lighting, installing under-counter or over-counter lights in your kitchen or utility room for task lighting, adding a decorative track and lighting to accent a sculpture or a painting, or accent and fine art lighting to illuminate a painting or sculpture. If energy efficiency is your concern, LED lighting is here and offering energy efficient and beautiful retrofit or new install options for your home. For a complete home solution, adding energy efficient LED lighting to that a home automation system and adding solar panels would provide for a complete home power saving solution that does not compromise the comfort and beauty of your home.